The most challenging workout helps develop explosive movement for advanced manoeuvres on the board incorporating power and rotation alongside a solid upper body and core. 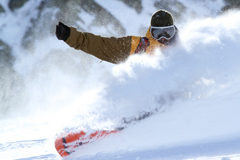 It helps to absorb high impact falls and unexpected movement when snowboarding, giving your body less chance of being injured, or the ability to prevent further damage to an injury that already exists. It utilizes the proprioceptive system, integrates static exercise for prolonged time in the one position and incorporates all of your stabilizers which help support all of your major muscles. Start with a 5 minute complete body warm-up (skip, jog, cycle, jumping jacks etc). As you land, come back into your starting position of a 90 degree squat. Repeat for 90 seconds. Don't forget to stretch once you are done the workout! Our snowboard specific stretches are a great way to loosen up once you've finished the workout above. Enjoy! Are you ready to take your training from the gym to the mountain? 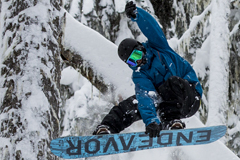 Be sure to check out our Snowboard Camps in Whistler, BC to learn how we can help you improve in the areas you want!